Could definitely mean that she is your world. You can promise the moon and stars for her and it would feel like being lost in a wonderful dimension when you’re with her. Clearly perfect for guys who have found the love of their lives; or even for those who truly love their mothers, sisters and grandmas. Have you ever, even once in your life, laid down under the skies at night and saw hundreds to thousands of stars and felt like compared to everything, you are merely a speck of dust? Not that it should bring you down. It’s simply the fact that the universe is so big that it could hold more mysteries than we ever could imagine. But before we could dive into the long and probably endless list of questions about the universe, we can lie down under the sky and simply adore it’s beauty. What we see above our heads is actually not even near half of the beauty that the outer space holds. From nebula to supernovas and planets, the wonder of the universe lies not only on its mysteries but also with what the eyes could see. 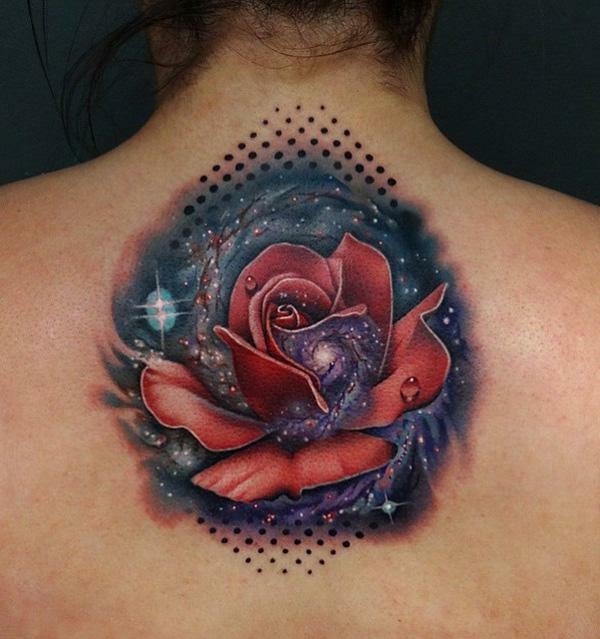 With both these things, it would be no wonder that a lot of tattoo enthusiasts and artists opt for space designs. 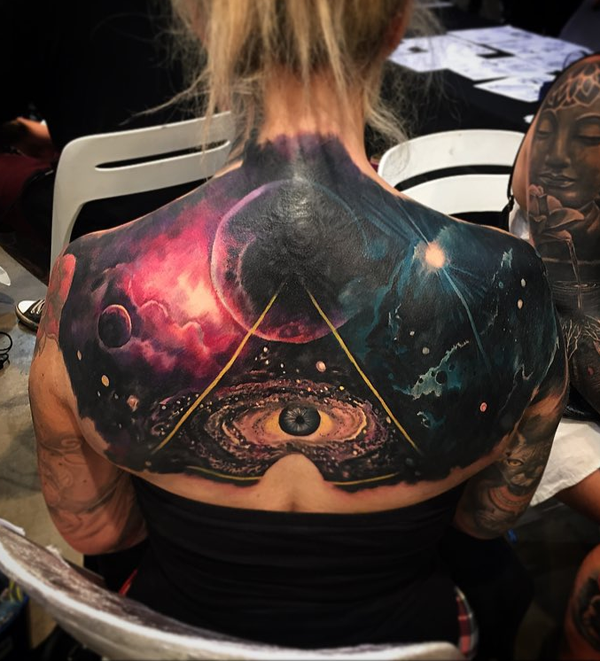 The technology and style of today’s tattoo industry as well as the skills and talents of tattoo artist could now capture a beauty that is out of this world. 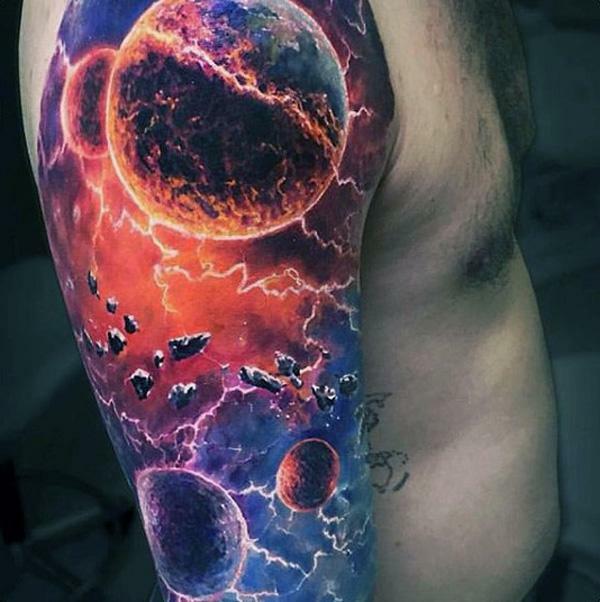 Having a bit of the space inked in your body can quickly transform you into a wonderful art piece. And more than that, you can hold some of the greatest messages that tattoos could hold. 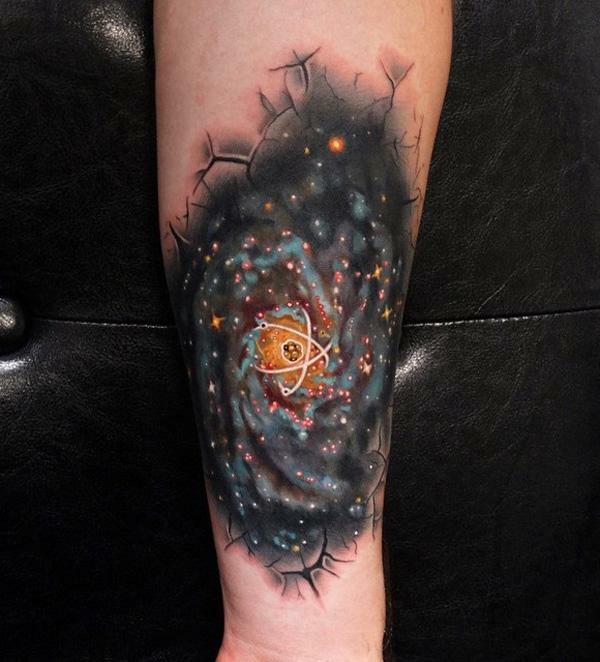 One of the simplest meanings behind these outer space tattoos could be associated with mystery. For us humans, there are a lot of questions that easily come to mind when we talk about the universe. Those mysteries can or can’t be answered. 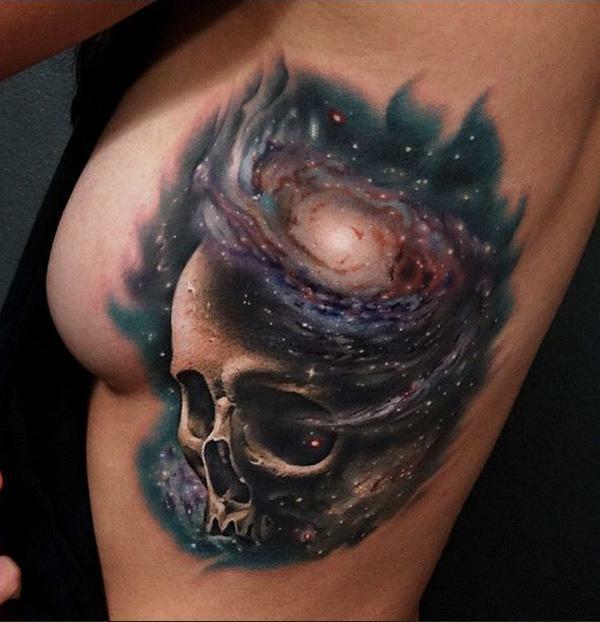 Your galaxy tattoo could either mean you, yourself, can be mysterious; perhaps it could mean your great love for mysteries. 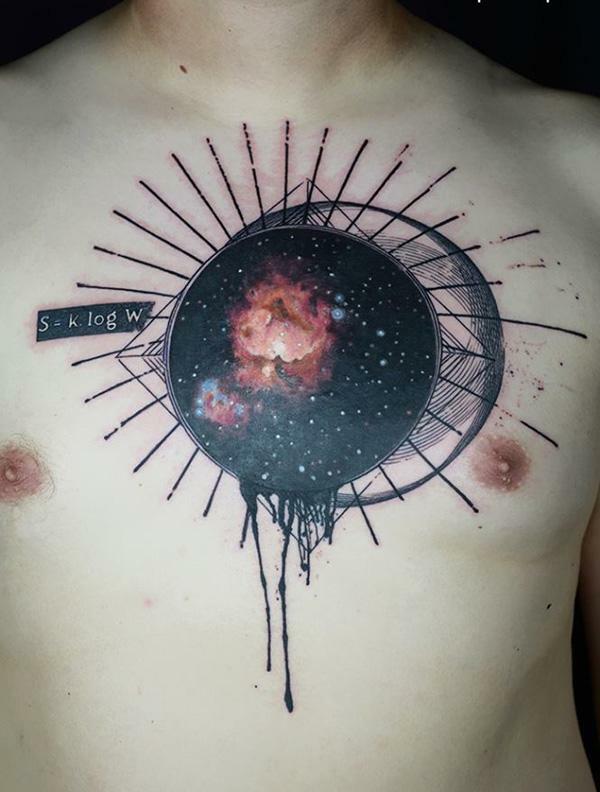 But probably the greatest and even deepest of all the messages that this tattoo design can hold is this: No matter who we are here on Earth, we are still nothing compared to the stars and the heavenly bodies. We are still under the same skies and see the same stars. We share the same sun, the same moon and the same home. So really, we should never feel inferior or superior as we are all born equal. Or if your meaning is totally different, that’s actually for you to determine. 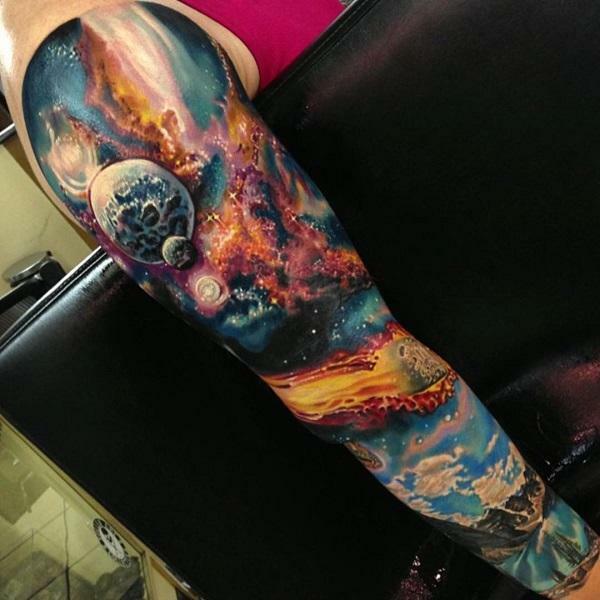 Nonetheless, here are some inspirations for your next tat! 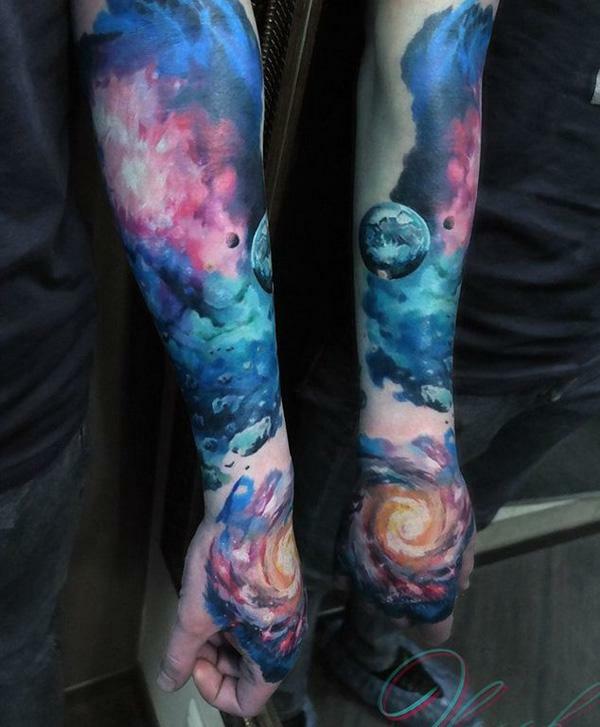 The great thing with galaxy tattoos is that it could be for both men and women. Here’s a simple planet design for both genders. By looking at it, it could be a symbol of strength and power. 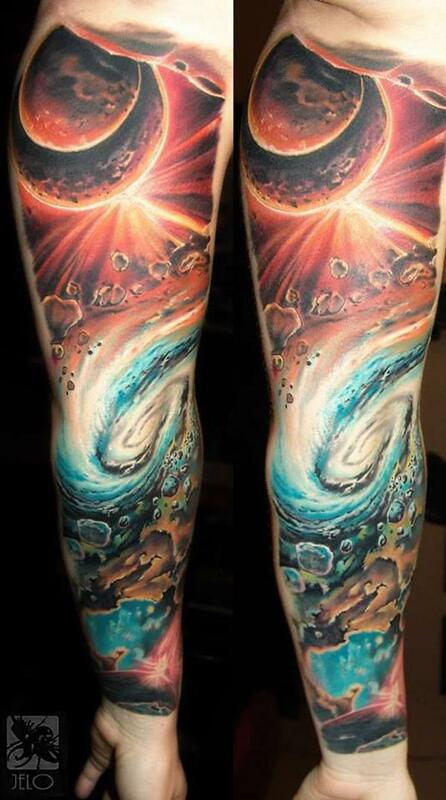 This one is a super cool full tattoo sleeve for men. It can signify that just above our normal world is a much more vast and powerful place. Roses are usually a symbol of love and galaxy, as said, could mean mystery. So this could be a lover of mysteries. 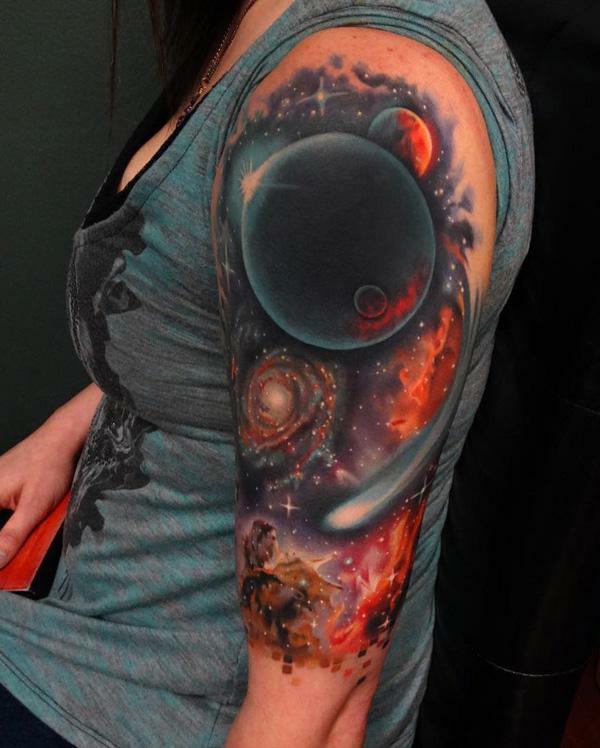 But to make it all romantic, it could also signify a love for eternity seeing that the universe could go on forever. One day, the Earth could end. This tattoo might seem a little frightening but it could also mean that we never know when our end is so live life to the fullest. 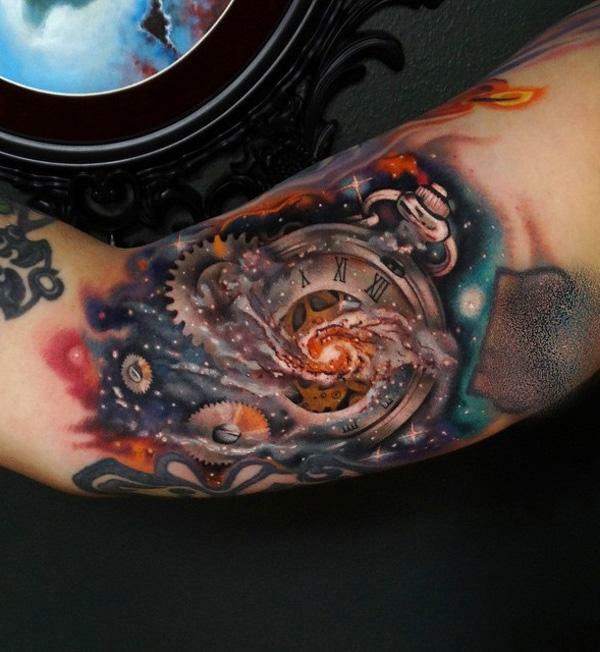 Plus the details in this design definitely brings the tattoo to life. 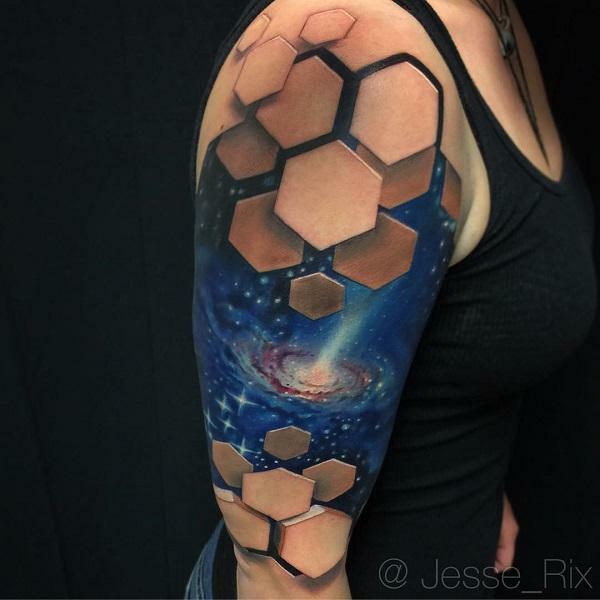 Space tattoos doesn’t really need to be bold and dark. Sometimes you can play with various styles and end up having unique kinds of tattoos. 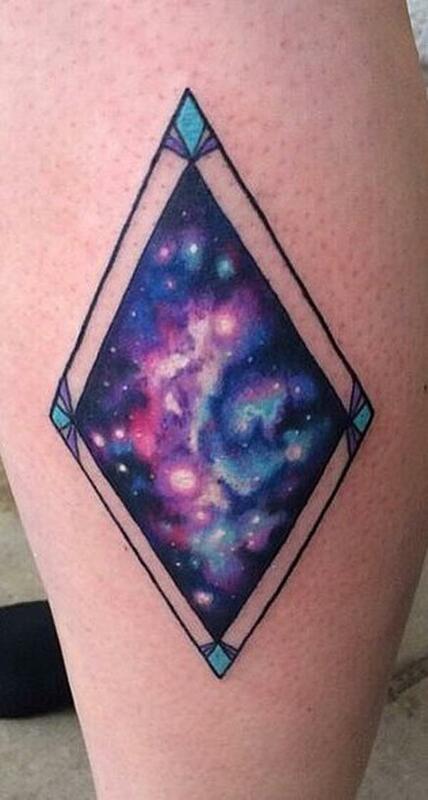 Here’s a space tattoo design in watercolor style. 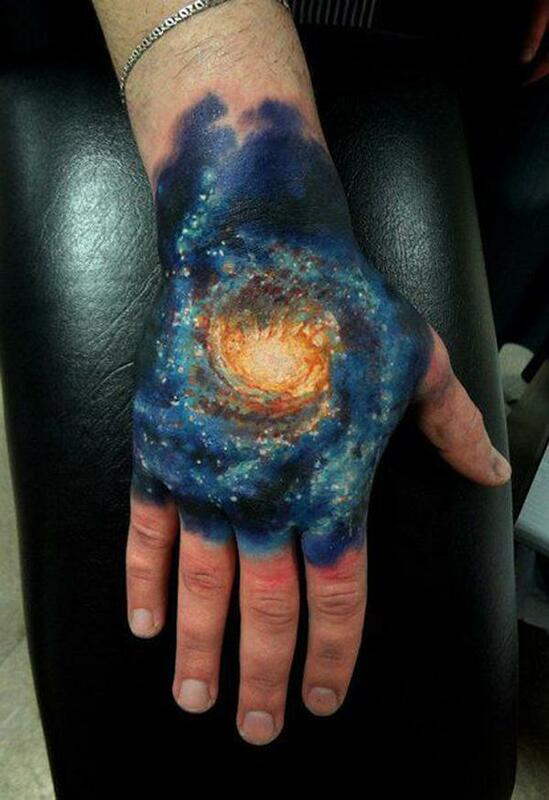 Here’s a super realistic tattoo (on the skin part only though) that shows off how you are a galaxy inside you. It could mean that you are a mystery. Behind all those physical traits, you could be something much more than what others perceive of you. This one is among the most simplest designs you can get. You wouldn’t really need intricate designs most of the time; just let the colors come to life. The space could be surreal and here’s a great design to bring its surrealism to a whole new level. It can be a play of innocence and wonder. “The All Seeing Eye” is usually controversial, what with the society thinking of it as a sign of evil. However, break down the myth by this design and if they ask, here’s the true meaning of the symbol: its actually a symbolism for high spiritual power or even an awakening of the spirit. Kind of reminds of you Alice in Wonderland. 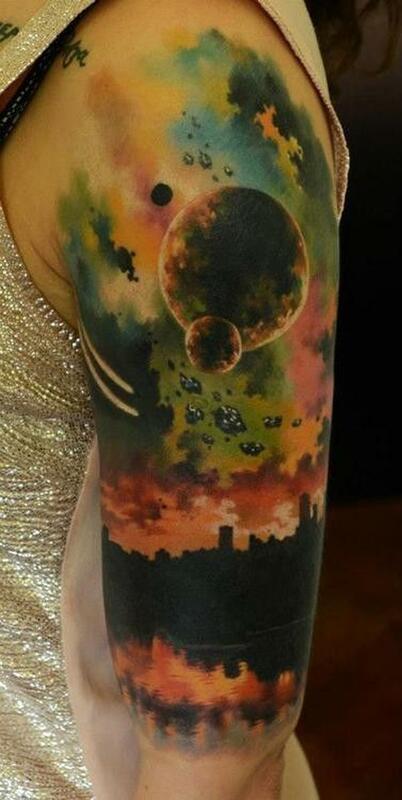 Here’s another choice for surrealistic space designs. It could mean that space and time could be two different things and yet the same as well. It may look simple and yet the colors of the universe is definitely a beauty. Here, a diamond is filled with the universe. 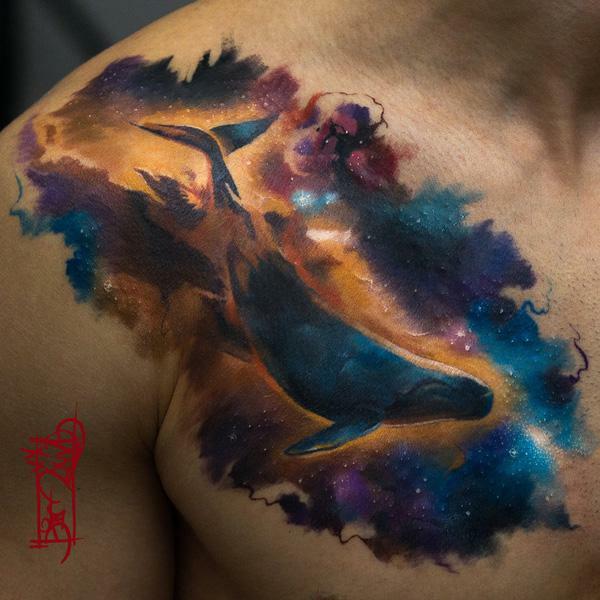 Whales could be a symbol for close relationships with our family or they can be emblems of our emotions. 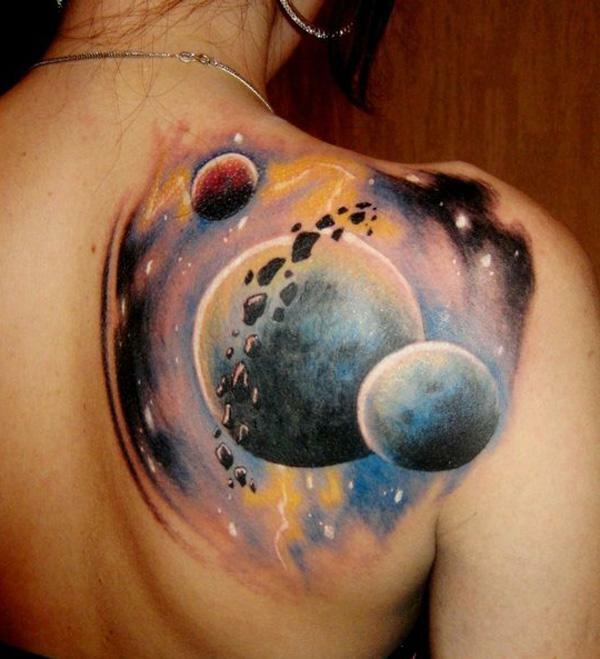 Combining it with a space tattoo could take the meaning to a new level or you can make one of your own. 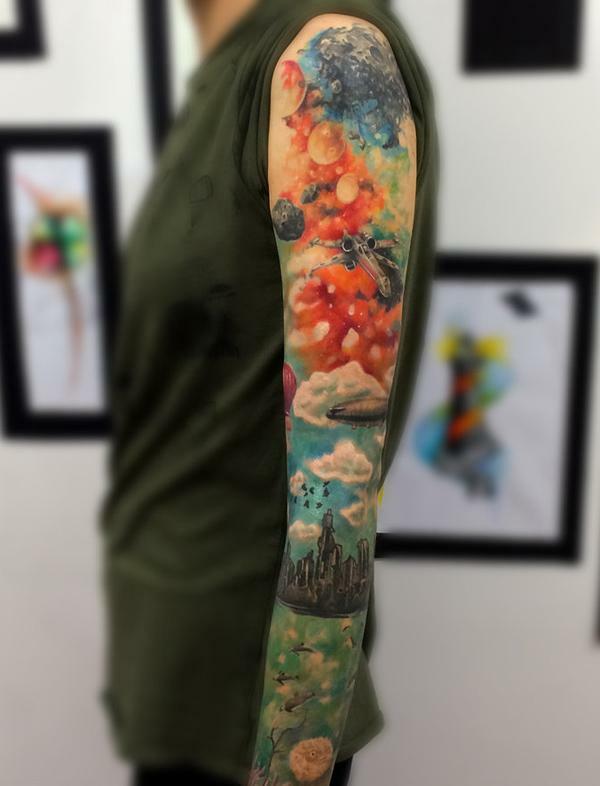 Full sleeve tattoos are really great to look at especially when you’ve got a wonderful design. 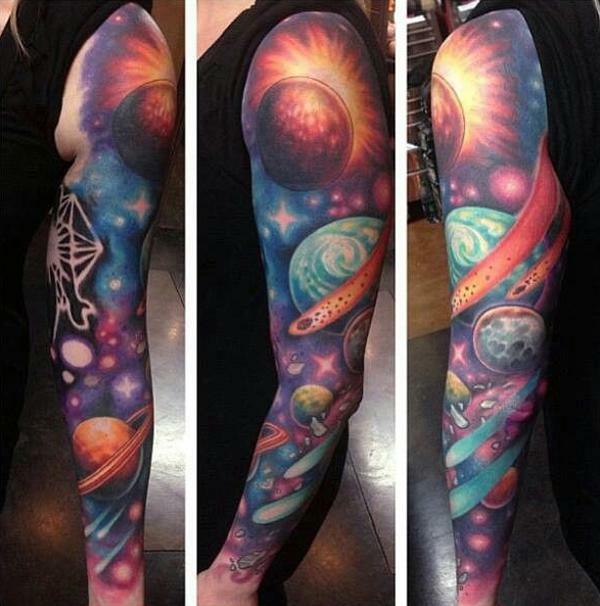 The colors of the universe plus the amazing scenes that happens in space is surely a design worthy of a full sleeve. 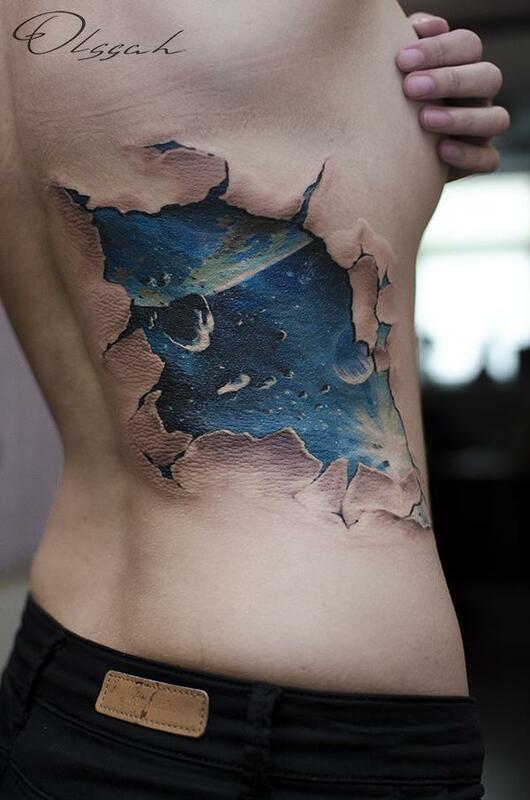 The 3D effect of this tattoo design could bring the whole tattoo to life; it would be like looking at either the beginning or the end of the universe. Whether it’s exactly the first or the latter could be your mystery. 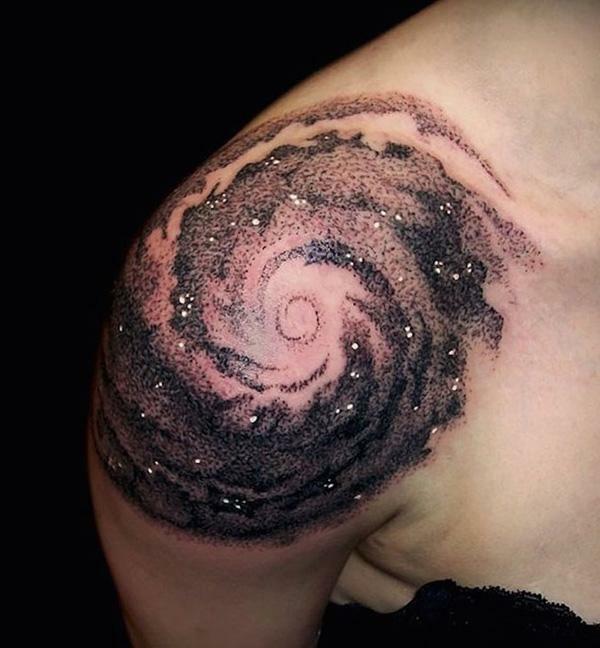 Black and white space tattoos are also beautiful to look at. It almost has an enchanting feel to it. It would look like the stars are in your body. 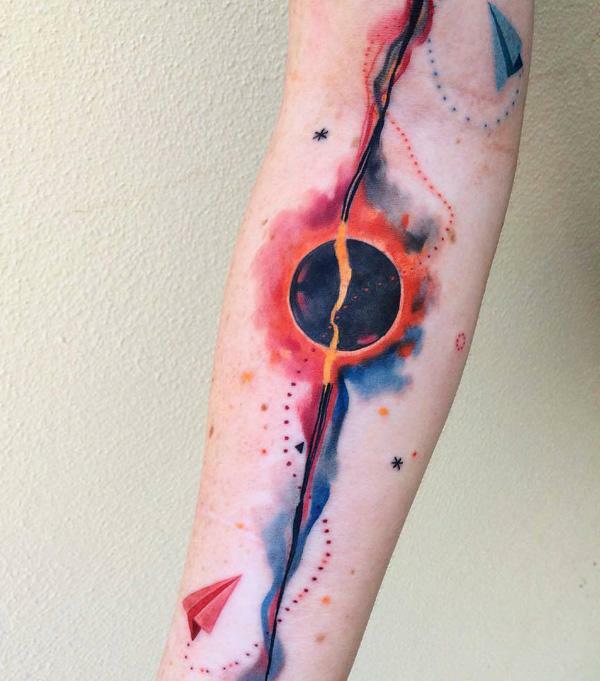 From solid black to blazing red, the colors are one of the reasons why getting a space tattoo is great. The contrast in colors could make it bold and alive. This one actually looks more fiery. Otherworldly. 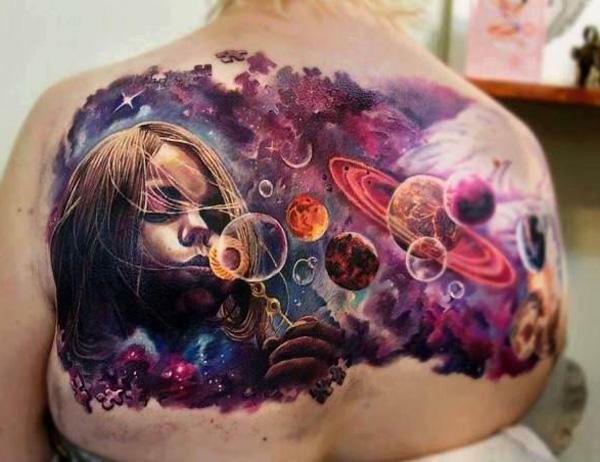 Perhaps another word to describe space tattoos. It might be a bit literal but some designs give off more than just the exact meaning. 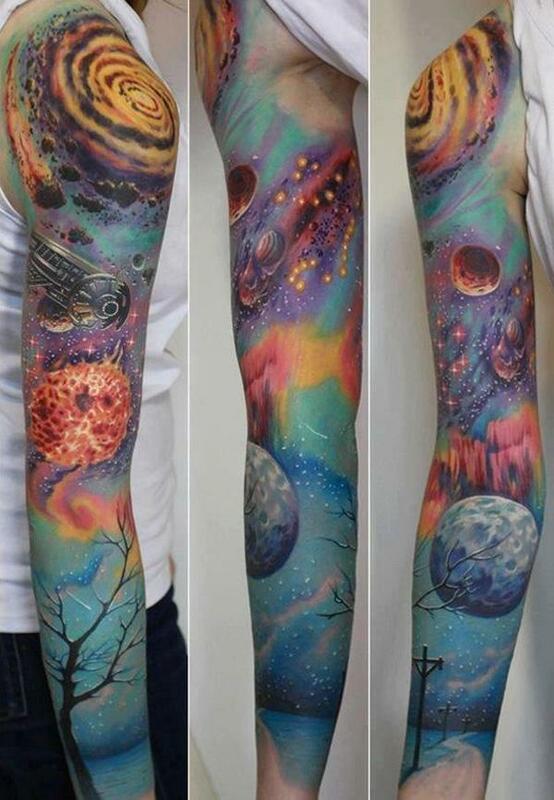 Here’s a beautiful full sleeve tattoo for men but could also be good for women if ever they’re interested. The colors are softer and there are more details in what’s going on in space such as comets and asteroids. There aren’t really much black in this design and is more colorful than the previous ones. 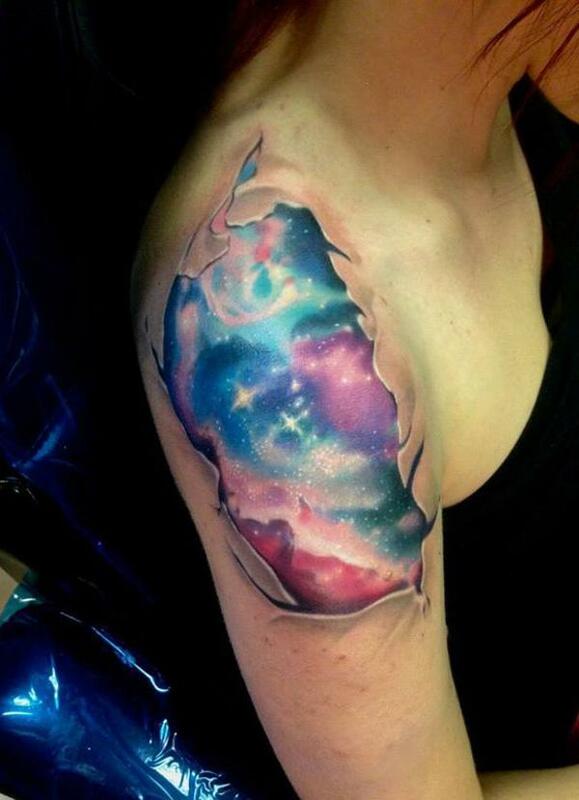 So if you want a lighter atmosphere to your tattoo, this is a design you’d love to have. It’s 3D effect could make you feel like you’re in space yourself, marveling at the amazing nebula, bright supernova and eerie calmness of the other parts of the universe. It could also keep you asking for more wonders. 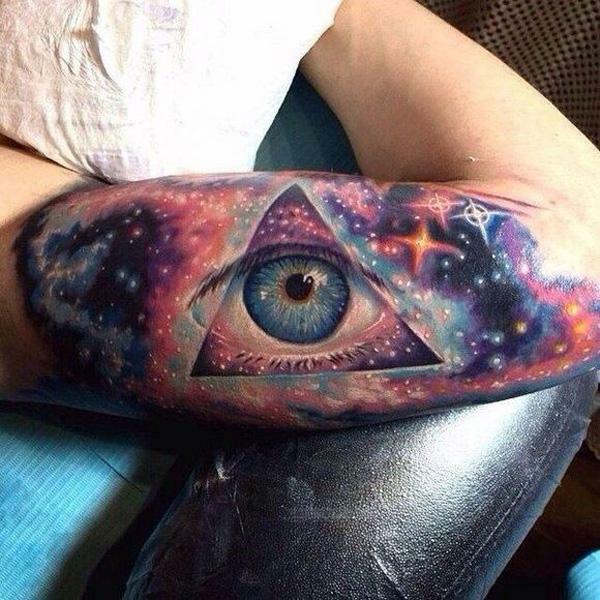 Hidden in the vast galaxy is an “all seeing eye” which adds more mystery to your tattoo. However the symbol is generally for symbolism of spiritual awakening and power. 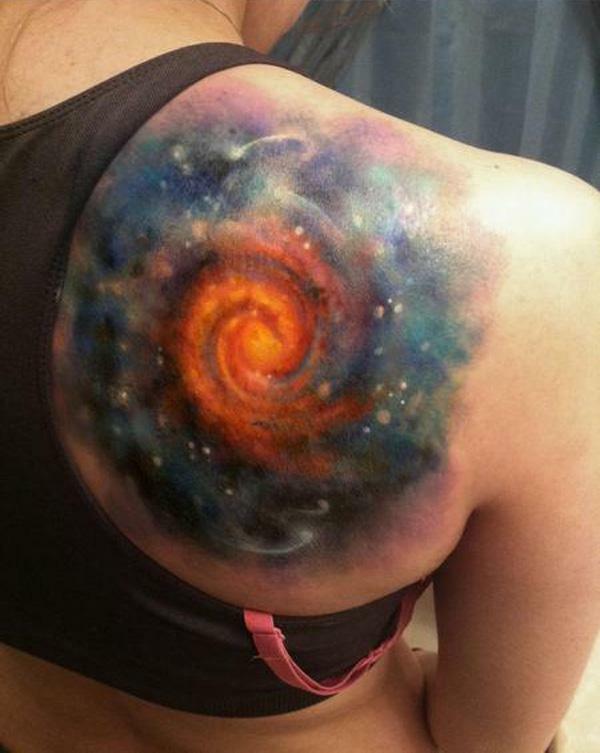 Here’s another cool space tattoo that is more colorful than dark and brooding. It shows more of stronger attributes than being mysterious, probably with the coloring. And it also looks like something out of a sci-fi book or comic which is perfect for sci-fi lovers. 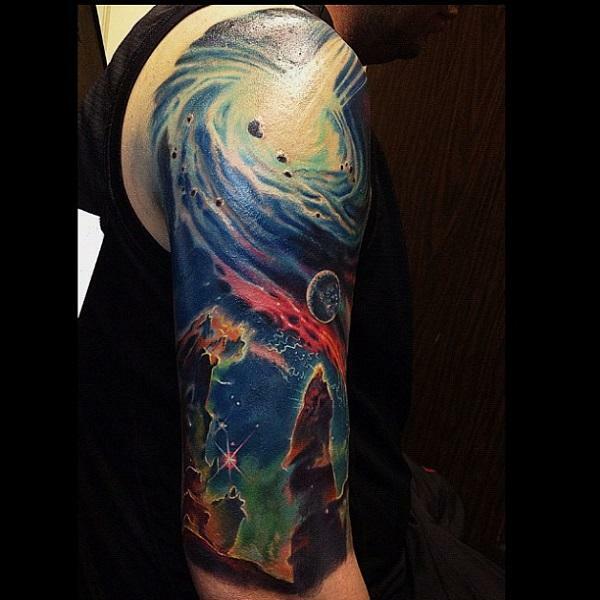 This tattoo depicts not just the space but also our home, the Earth. It’s lighter and shows the amazing difference here on Earth and in the outer space. Each person would have their story with their tattoos. Usually however, skulls symbolize more than death, but a celebration of life. 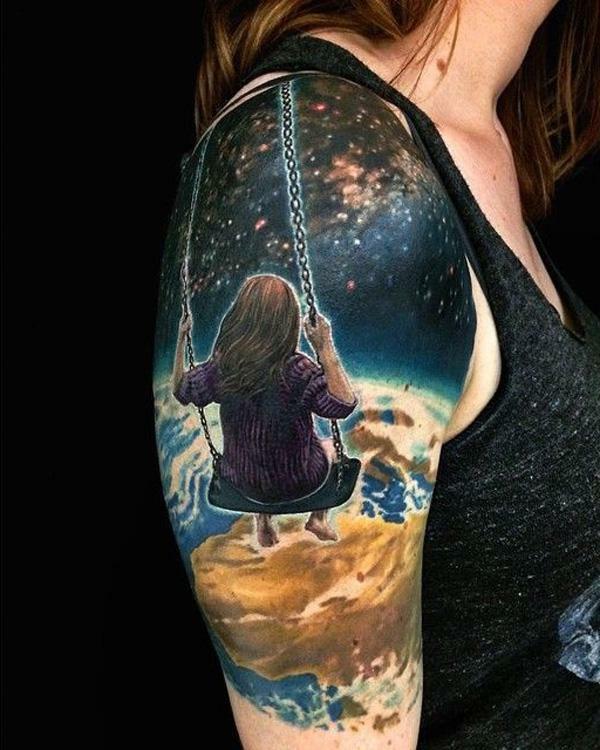 This tattoo could be a great depiction of celebrating your own life in a universe that is vast and unpredictable. 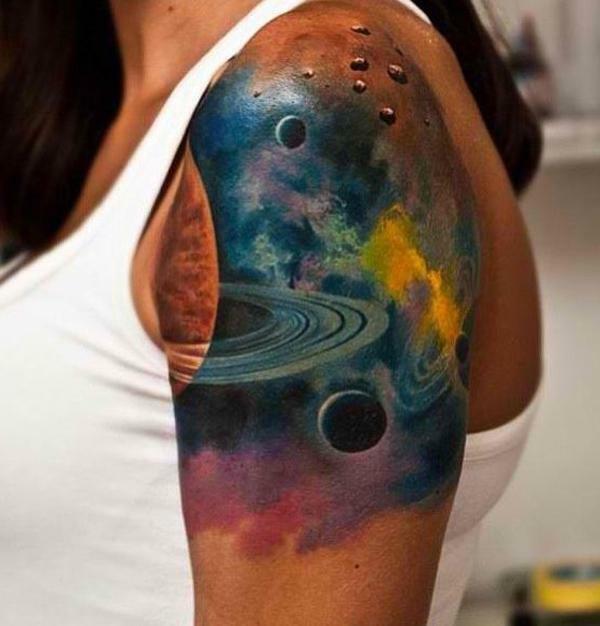 This tattoo shows half of Saturn and of course, it’s beautiful rings plus some of its moon. You could simply be a fan of sci-fi or just be fond of Saturn. Or you can also have it as a symbol of dominance, stability or labor among its other meanings. Tulips are most generally associated with love; red for true love and yellow ones for cheerfulness. 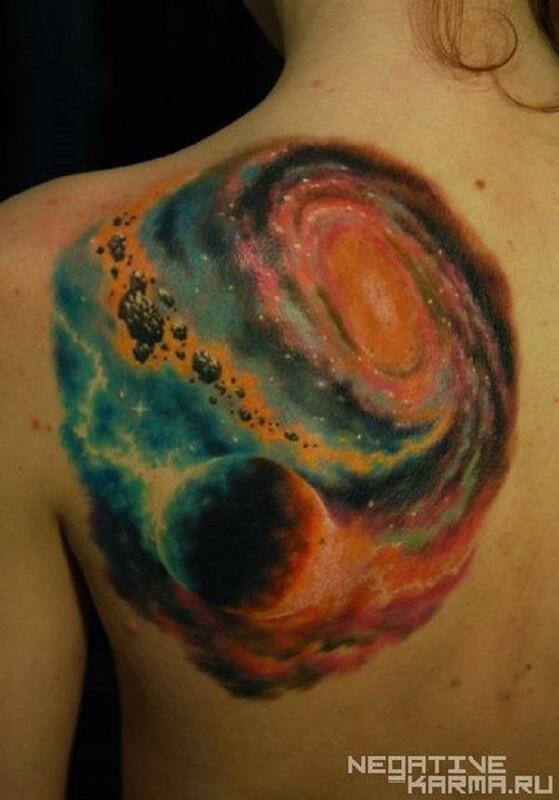 This tattoo could simply mean constant (seeing as the universe is constant) happiness in love. Looks familiar? Maybe because you’ve seen it somewhere. 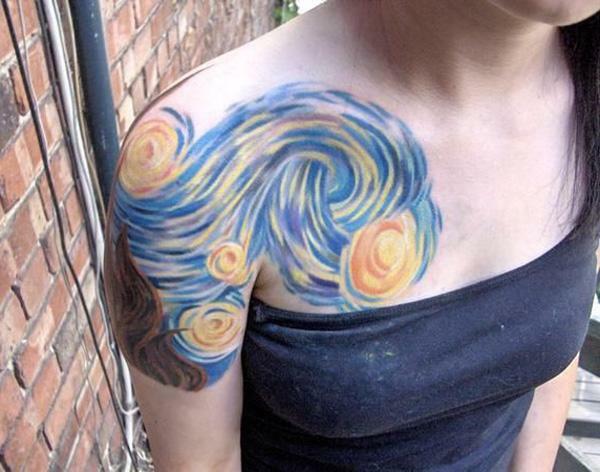 Here’s a great imitation of Vincent Van Gogh’s Starry Night. It’s the abstract version of a good star gazing. 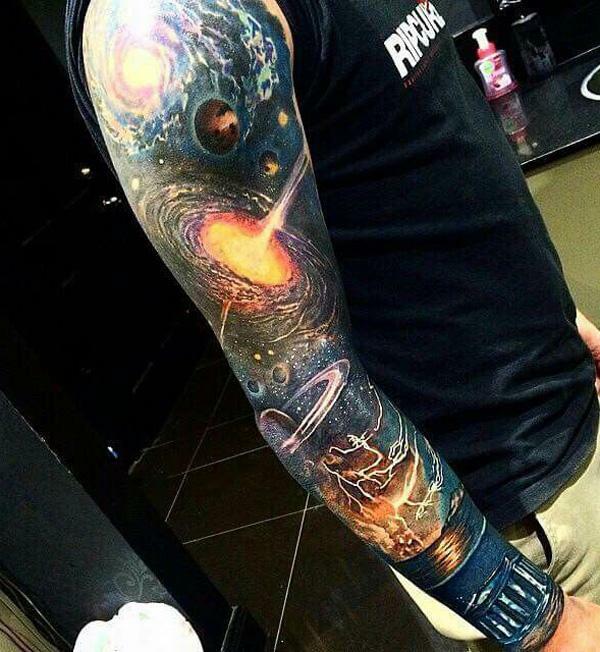 Even if you tattoo a galaxy in your sleeve up to your hand, it wouldn’t really look messy. Instead it would still look magical and beautiful, especially with much lighter style and colors. 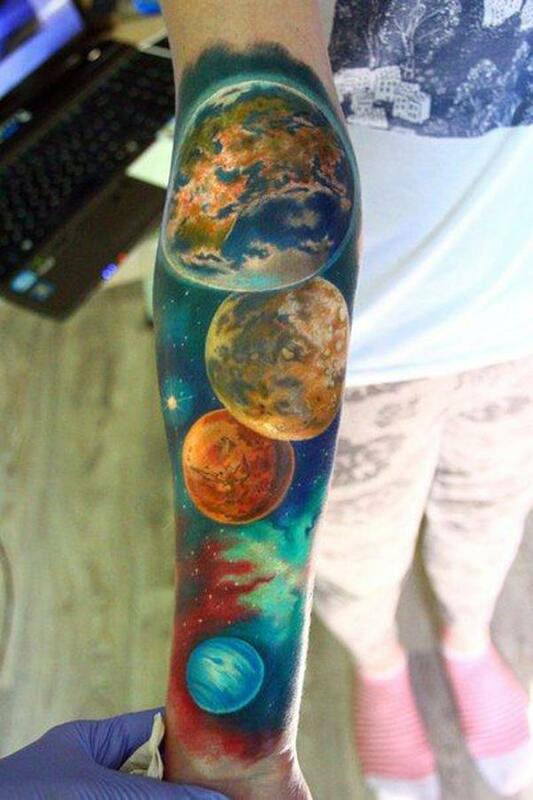 Nothing beats a beautifully made tattoo. 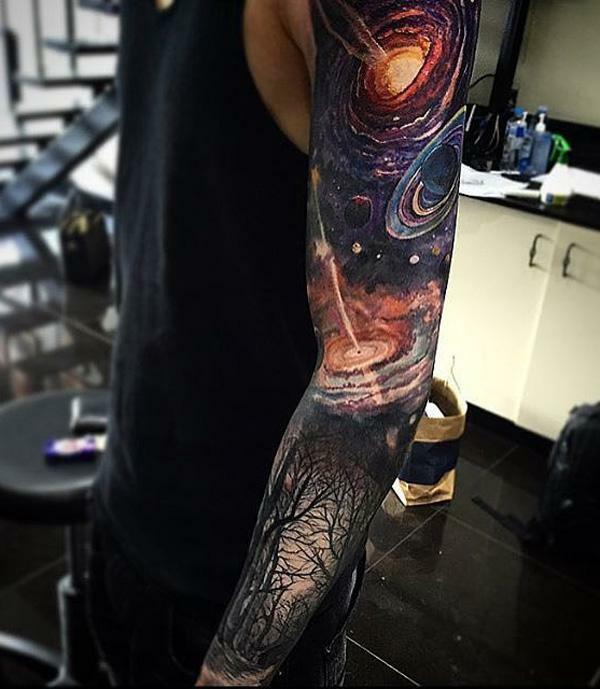 It’s usually hard to get a beautiful galaxy tattoo but when you do, the colors could transport you directly in a haze of mystery and peace. 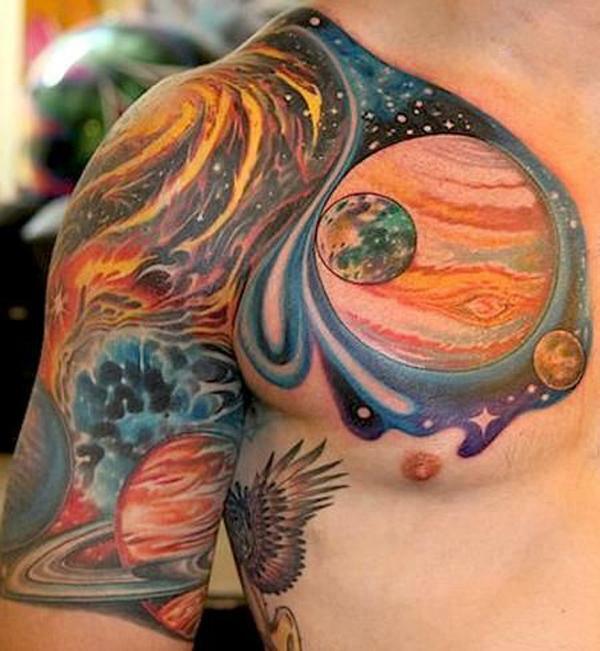 Another “space inside” idea; best if you liked the first one but you need something much bigger and more colorful. Or if you’re creeped out by the too realistic skin peeling off on the first choice. This one is still cool though. Here’s a simple abstract tattoo that’s best appreciated on flat places like the back or a man’s chest. 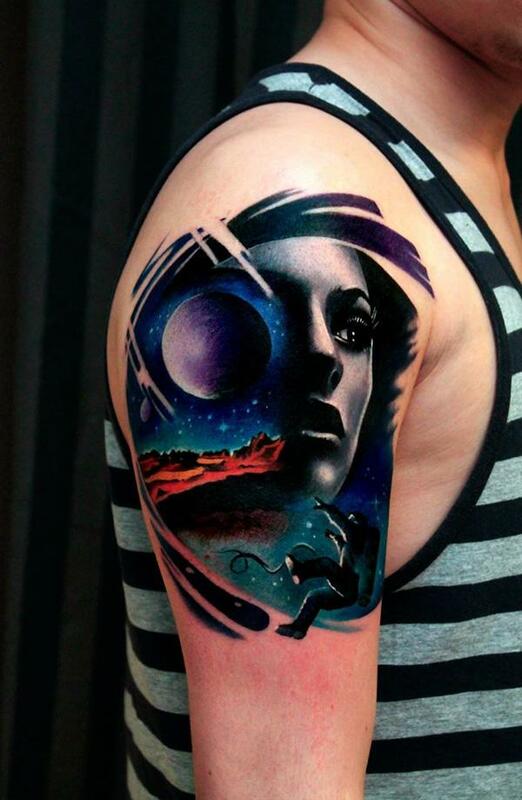 Here’s a cool sci-fi tattoo for everyone who loves the genre. It would seem to be relaying a message that all of us are made of the same materials and are from the same beginning. Life, just like the universe is a great mystery. But sometimes you just have to enjoy it. 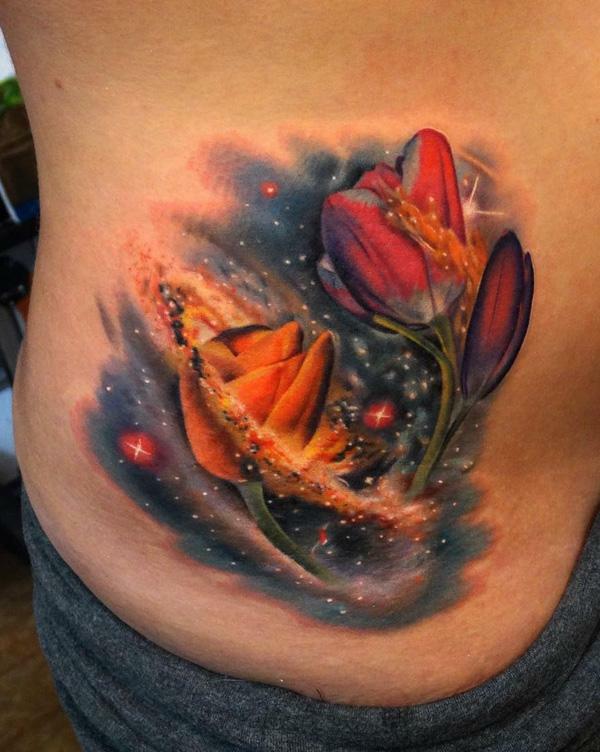 Here’s a tattoo to enjoy the beautiful space and beautiful life. 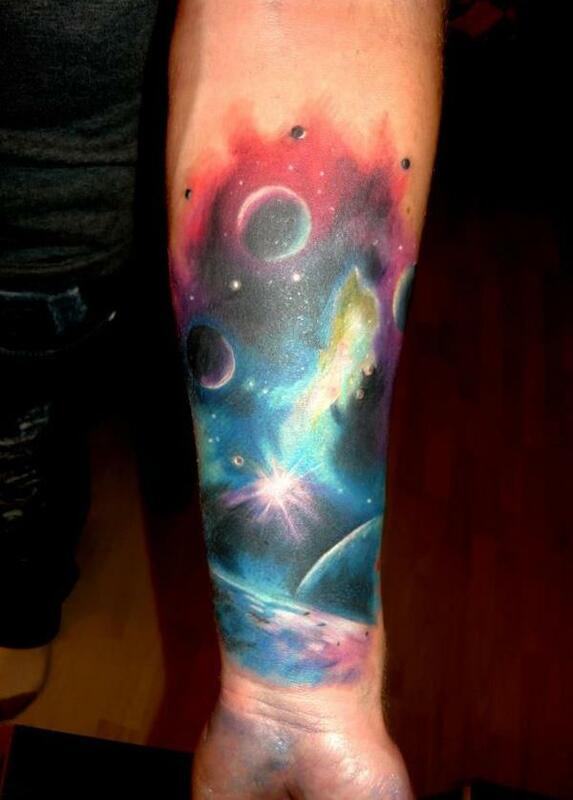 Here’s a more realistic design that you can fill up your sleeve with. It indicates some of the amazing wonders of the universe. This design is like losing part of your hand into oblivion which is a cool and nice illusion. It’s wonderful and simple as well. If you want more familiar things, how about our Earth plus our neighbor planets? These are beautiful portraits of the planets of the solar system which we all know about but is still foreign. It could symbolize how things could look the same but could feel differently. 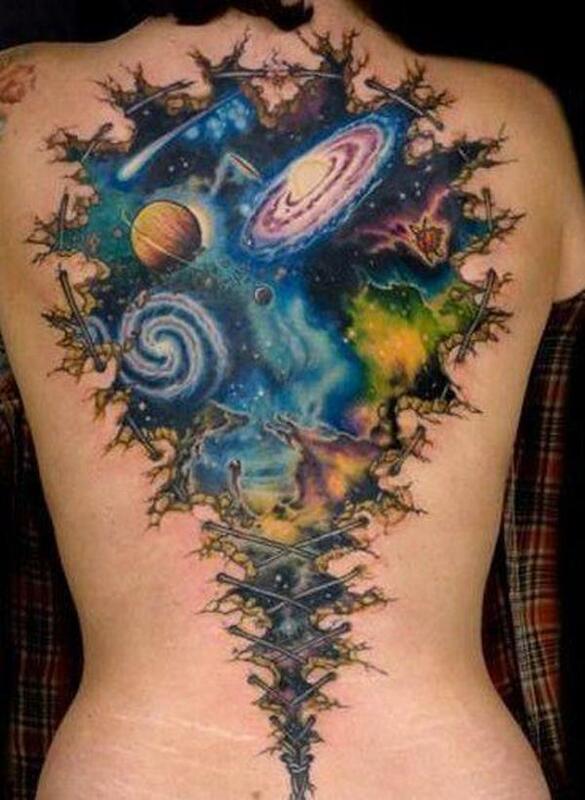 Another space inside tattoo design. This one is much subtler and more beautiful what with the colors and seemingly twinkling and bright stars. 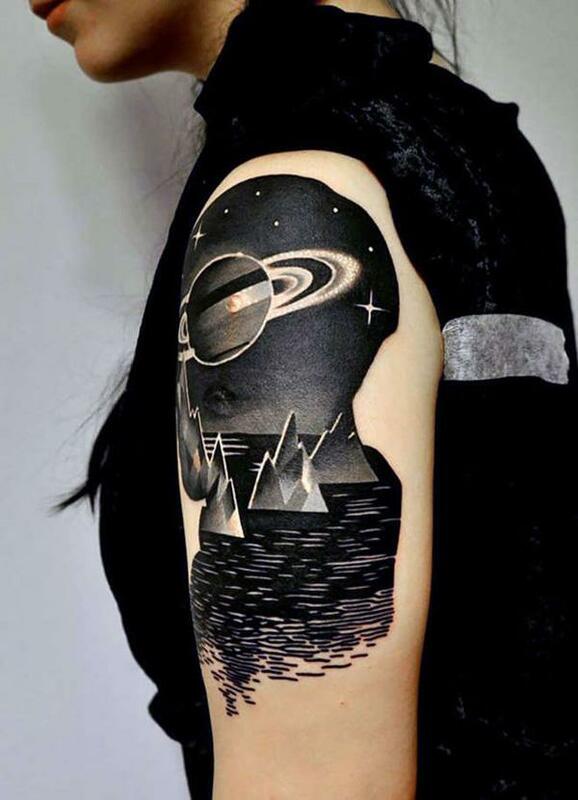 If you want to step away of the blues and violets or oranges and reds, here’s a black and white tattoo featuring Saturn and its beautiful rings. Space is definitely fascinating. I would make such a tattoo only at a high-quallified master as it’s very hard work. It takes a lot of time because it’s tricky to colourcast the texture on skin. Another drawback is that it’s more difficult to remove it later.